Holy Moly! Did you know you could pin pages without pictures? Did you know you could pin images on Facebook? Did you know that after you pin something you could change the location that users land when they click on the pin? While testing out images based on my “how to make images go viral on Pinterest post”, I learned a few new things. So the basic idea of Pinterest is to categorize things that you like and find out in the world wide web onto your Pinterest wall. When you find something cool, you “pin” it. That means Pinterest goes to that webpage and finds an image it will use to represent that page on your board. In the end you have a wall full of images that are are really just links to webpages. BUT. . .
Pinterest gives you a little control over these pins. When you hover over the image, a pop up “Edit Pin” button becomes visible. When you click this button, you can edit the description, change the board it is categorized on AND you can edit the link. That means you can change the link. So if you want to pin a page without pictures, merely upload an image directly to Pinterest. Then press the edit button and paste in the url of the page you want to pin. Perhaps you have clients whose sites don’t have good images. Make an image that describes their pages, upload the images and edit the link to send the traffic to those pages. This is going to seem like a complete waste of space, but if you want to pin something on Facebook, upload the image and then edit the link to go to the Facebook page of choice. Now, if you want to pin an image that is on Facebook, you can do that too. Go to Facebook and find the image you want to pin. Right click on that image and click “view image”. When you do that the image will appear on a page by itself. That page will have a really, really long url that starts with something like: http://a8.sphotos.ak.fbcdn.net/. . . . . . 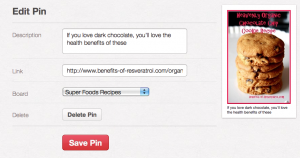 Copy and paste that pin (or click the pin it button in your toolbar) into the Add Pin section on Pinterest. Complete the description, choose a “board” and press “Pin it”. Then go edit the pin, delete the long url and replace it with the Facebook page link you want people to go to. Presto! When you edit your pins, as described twice above, replace the url with a redirect. For instance I own the domain name “StockMediaMarketplace.com” that redirects people to Pond5.com. If I were to put stockmediamarketplace.com into the url section of my Pinterest Pins, they would all take people to Pond5.com. I could do that on a bunch of pins, right? Then. . . . what would happen if I changed the place that stockmediamarketplace.com redirected people to? Yep, they would all be redirected to a new site. Brilliant, eh? If you think that stuff is cool, make sure you pick up my video on Pinterest called “Making Money with Pinterest”. And learn a bunch more cool stuff.